Never stop complaining that CGI looks fake, people. It gets results. While Disney was funding research into making CGI rainbows look more realistic, the researchers found a mechanism to create rare twinned rainbows! Twinned rainbows are not double rainbows. 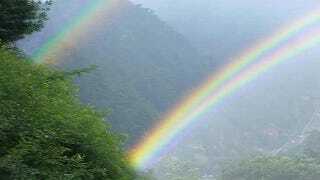 Although both include two rainbows for the price of one, double rainbows stay separate from each other. Twinned rainbows start from the same base before lifting one arch above another. They're much more rare. When researchers, doing work sponsored by Disney, wanted to model one, they found that no one entirely understood the twinned rainbow phenomenon. They set to work with computer models, trying to figure exactly what was happening. This work started by counteracting what is commonly assumed about raindrops. I learned in school that raindrops only get their characteristic teardrop shape when they're sliding down window panes. In the air, they're spherical drops. Because of their shape, when light passes through them it is scattered in a certain way. Lorenz-Mie theory is a series of equations that explain exactly how the light scatters. It explains how light is bent as it goes through a sphere. It explains how light is polarized - its waves all moving in the same direction - as it goes through a sphere. It explains rainbows. Sadly, it doesn't explain twinned rainbows. Because drops, especially large ones, aren't spherical at all as they fall. Instead, they form shapes that the researchers called burgeroids. The name explains the shape, but not why the shape occurs. As drops get bigger, they face air resistance as they fall. This flattens them out on the bottom and creates a wide, flat curve on the top. The curves on the sides are relatively sharp and dramatic. These effects increase with size. At about a half millimeter, a drop will look like a sphere. By three millimeters it looks pretty much like it could flop down on your plate and you'd eat it. The small drops form rainbows that can be explained by Lorenz-Mie Scattering. The larger burgeroid drops can't. The team modeled the drops, mapping each drop out, bottom-bun down, on a grid, sending patches of light through each of the little squares on the grid, and mapping the way they came out on the other side. They also took a look at how the position of the sun and the polarization affect non-spherical water droplets. Horizontally polarized light will cause the light from a spherical drop to form a rainbow circle that fades out at the sides. Vertical polarization causes light to fade out at the top and the bottom. A light that's dead-on to the drop will evenly ring a drop with light. Light from 20 degrees will bring one edge of the rainbow closer to the drop while the other edge scoots away from it. Forty degrees will exaggerate the effect even more, so that the bottom edge of the drop seems to almost be touching the rainbow, while they top edge is far away. A different angle of the sun causes vastly different arches. Through the extensive modelling, the researchers came up with a comprehensive theory of scattering light that matches up with Lorenz-Mie theory when the drops are close to spherical, and diverges from it when they aren't. They've actually come up with a model that explains rainbow optics more comprehensively than ever before. But what causes the strange twinned rainbow phenomenon? Colliding rainstorms. When one rainstorm made of small, mostly-spherical drops is hit just right by the sun, it creates a rainbow with certain bases and a certain arch. When another rainstorm, with larger drops that have formed more pronounced burgeroids, blunders into the same space, a rainbow is created that has the same bases, but a different arch. This causes twinned rainbows. And lots of oohing and ahhing from the crowd. Good work, guys! But if they don't have a twinned rainbow in the next CGI Disney movie I will be very disappointed.